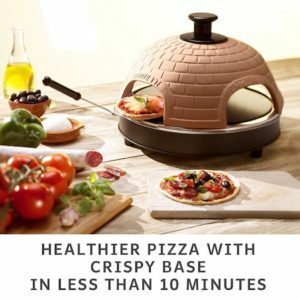 Got your heart set on an indoor pizza maker yet want something that looks like an authentic outdoor pizza oven? 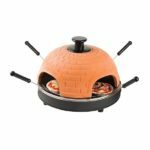 This electric Global Gourmet model looks like a more compact version of a clay oven that you would find in any pizzeria, with a genuine terracotta dome for a true taste of Italy. What’s more, it heats up to 225°C in around 10 minutes, so those last minute ‘pizza for dinner’ ideas are within easy reach. It also makes it easier to prepare pizzas from fresh, avoiding unhealthy shop bought alternatives (or having to wait for ages for the oven to preheat and cook them). And at just 1000W, it will require less power than a standard oven. You can easily fit four personal sized pizzas under the dome, so nobody is left out. With four openings and pizza spatulas/peels included, everyone can monitor their own creation without any hassle. It also comfortably fits a larger pizza if you wish. Don’t let the thought of cleaning it afterwards put you off; the dome can be removed, and the non-stick base won’t create any mess and doesn’t require extra trays. The construction also means it can be stored away much easier. It does get quite warm in use, so it is best to set it on a heatproof surface. Take the necessary precautions, such as purchasing a heatproof mat. This pizza oven is great fun and the perfect centrepiece for get-togethers, or addition to a barbecue, but the quality of the pizzas (with a little practice) means it is far from just a novelty item. For further peace of mind, there is a 60-day returns guarantee and a one year warranty included.